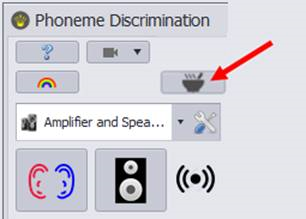 The phoneme discrimination test uses commonly used phonemes in many languages. All phonemes have been loudness balanced. Intensity roving is applied in a range of ±3 dB. The task consists of an odd ball paradigm. 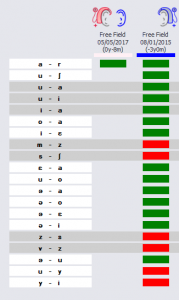 A§E phoneme discrimination test results. Each column represents a different test session with its own date and configuration of the hearing aids. A powerful feature of A§E consists of the possibility to use the test engine of the phoneme discrimination to build your own psychoacoustic test. Have a look at the instructional videos to learn how to build your own discrimination test.